An essential amino acid or indispensable amino acid is an phenylalanine, valine, threonine, tryptophan, methionine, leucine, isoleucine, lysine, and histidine. Six amino acids are considered conditionally essential in the human diet, meaning their synthesis can be limited under special pathophysiological conditions, such as prematurity in the infant or individuals in severe catabolic distress. These six are arginine, cysteine, glycine, glutamine, proline and tyrosine. Five amino acids are dispensable in humans, meaning they can be synthesized in the body. These five are alanine, aspartic acid, asparagine, glutamic acid and serine. (**) Pyrrolysine, sometimes considered "the 22nd amino acid", is not listed here as it is not used by humans. Estimating the daily requirement for the indispensable amino acids has proven to be difficult; these numbers have undergone considerable revision over the last 20 years. The following table lists the WHO recommended daily amounts currently in use for essential amino acids in adult humans, together with their standard one-letter abbreviations. Food sources are identified based on the USDA National Nutrient Database Release. The recommended daily intakes for children aged three years and older is 10% to 20% higher than adult levels and those for infants can be as much as 150% higher in the first year of life. Cysteine (or sulphur-containing amino acids), tyrosine (or aromatic amino acids), and arginine are always required by infants and growing children. Because of the obvious difference in the nutritional value of zein versus casein in rat nutrition, various attempts have been made to express the "quality" or "value" of various kinds of protein. Measures include the biological value, net protein utilization, protein efficiency ratio, protein digestibility-corrected amino acid score and complete protein concept. These concepts are important in the livestock industry, because the relative lack of one or more of the essential amino acids in animal feeds would have a limiting effect on growth and thus on feed conversion ratio. Thus, various feedstuffs may be fed in combination to increase net protein utilization, or a supplement of an individual amino acid (methionine, lysine, threonine, or tryptophan) can be added to the feed. Although proteins from plant sources tend to have a relatively low biological value, in comparison to protein from eggs or milk, they are nevertheless "complete" in that they contain at least trace amounts of all of the amino acids that are essential in human nutrition. Eating various plant foods in combination can provide a protein of higher biological value. Certain native combinations of foods, such as corn and beans, soybeans and rice, or red beans and rice, contain the essential amino acids necessary for humans in adequate amounts. If one of the nonessential amino acids is less than needed for an individual the utilization of other amino acids will be hindered and thus protein synthesis will be less than what it usually is, even in the presence of adequate total nitrogen intake. The amino acids that are essential in the human diet were established in a series of experiments led by nitrogen balance. Rose noted that the symptoms of nervousness, exhaustion, and dizziness were encountered to a greater or lesser extent whenever human subjects were deprived of an essential amino acid. Essential amino acid deficiency should be distinguished from protein-energy malnutrition, which can manifest as marasmus or kwashiorkor. Kwashiorkor was once attributed to pure protein deficiency in individuals who were consuming enough calories ("sugar baby syndrome"). However, this theory has been challenged by the finding that there is no difference in the diets of children developing marasmus as opposed to kwashiorkor. Still, for instance in DRIs maintained by the USDA, lack of one or more of the essential amino acids is described as protein-energy malnutrition. Using the one-letter designation shown above, mnemonic devices have been developed for use in memorizing the essential amino acids. Previous devices have utilized the first letter of the amino acids' names, and in general did not include arginine which is not always essential. Mnemonic devices in common use are PVT TIM HaLL and TT HALL V(ery) IMP(ortant). Another method uses the first letter of each essential amino acid to begin each word in a phrase, such as: "Any Help In Learning These Little Molecules Proves Truly Valuable". This method begins with the two amino acids that need some qualifications as to their requirements. ^ Young VR (1994). "Adult amino acid requirements: the case for a major revision in current recommendations". J. Nutr. 124 (8 Suppl): 1517S–1523S. ^ Fürst P, Stehle P (1 June 2004). "What are the essential elements needed for the determination of amino acid requirements in humans?". Journal of Nutrition 134 (6 Suppl): 1558S–1565S. ^ Reeds PJ (1 July 2000). "Dispensable and indispensable amino acids for humans". J. Nutr. 130 (7): 1835S–40S. ^ Imura K, Okada A (1998). "Amino acid metabolism in pediatric patients". Nutrition 14 (1): 143–8. ^ Woolf, P. J.; Fu, L. L.; Basu, A. (2011). Haslam, Niall James, ed. "VProtein: Identifying Optimal Amino Acid Complements from Plant-Based Foods". PLoS ONE 6 (4): e18836. ^ http://hyperphysics.phy-astr.gsu.edu/hbase/organic/essam.html "Tillery points out that a number of popular ethnic foods involve such a combination, so that in a single dish, one might hope to get the ten essential amino acids. Mexican corn and beans, Japanese rice and soybeans, and Cajun red beans and rice are examples of such fortuitous combinations." ^ J D Kopple and M E Swendseid (May 1975). "Evidence that histidine is an essential amino acid in normal and chronically uremic man.". J Clin Invest. 55 (5): 881–891. ^ Rose, WC; Haines, WJ; Warner, DT (1951). "The amino acid requirements of man. III. 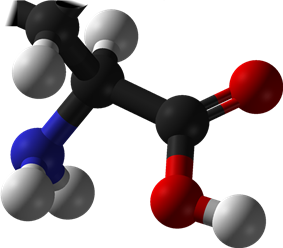 The role of isoleucine; additional evidence concerning histidine" (PDF). J Biol Chem 193 (2): 605–612. ^ ;MATT VIL PLy Essential amino acids Essential amino acids, Mnemonic. ^ Williams, R.A.D. ; Eliot, J.C. (1989). Basic and Applied Dental Biochemistry. Elsevier Health Sciences. p. 149.